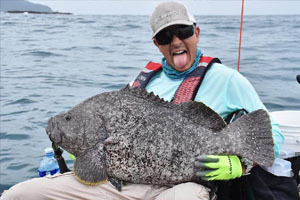 Angler Ricci Chavez caught this potential All-Tackle world record leather bass (Dermatolepis dermatolepis) on August 12, 2018 while fishing out of Los Buzos Panama Kayak Fishing Lodge. Weighing in at 12.78 kilograms (28 pounds, 2 ounces), Chavez's catch is heavy enough to replace the existing record of 12.47 kilograms (27 pounds, 8 ounces). 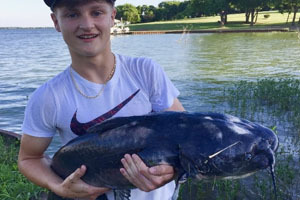 Angler Will Titsworth – age 15 – of Rowlett, Texas caught and released this 11.96-kilogram (26-pound, 6-ounce) channel catfish (Ictalurus punctatus) on May 30, 2018 while fishing the Ray Hubbard Reservoir in Rockwall, Texas. 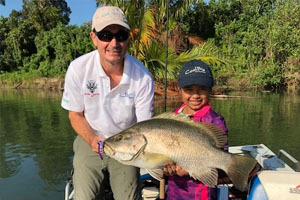 If approved, the catch will earn Titsworth the new male Junior world record, which currently stands at 10.88 kilograms (24 pounds). 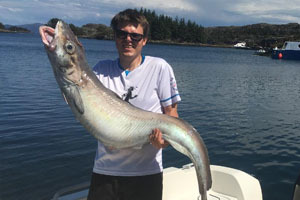 Norwegian angler Alf Ronny Karbo potentially set the All-Tackle world record for blue ling (Molva dypterygia) with this 17.76-kilogram (39-pound, 2-ounce) specimen that he caught on July 11, 2018 while fishing off Bomlafjorden, Norway. If approved, the catch will replace the existing world record of 16.05 kilograms (35 pounds, 6 ounces).